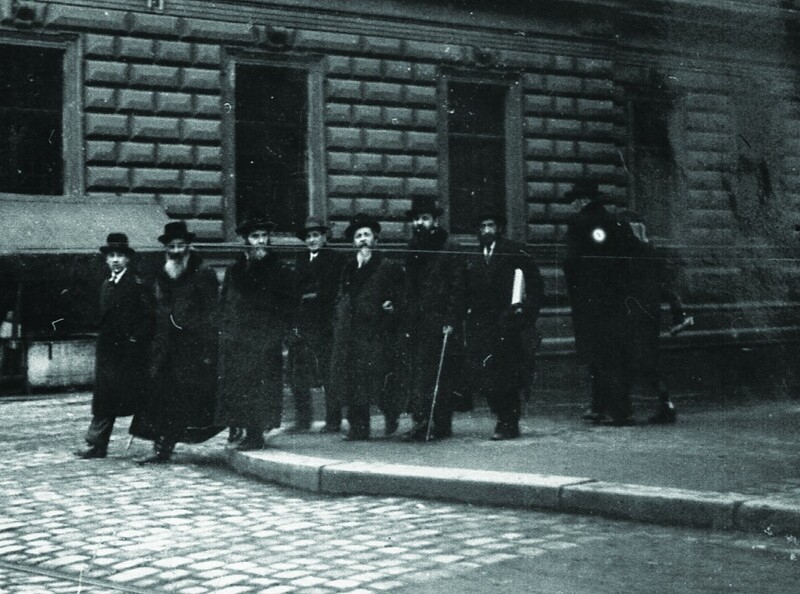 Harav Avraham Yeshoshua Heschel, the Kopycznitzer Rebbe, zy”a, (third from right) in Vienna. Seventy-five years ago this week, as half a million pro-Nazi residents cheered wildly, the German army marched into Vienna in what would become known as the Anschluss. Austria was taken without firing a shot. The Jews of Vienna saw their world crash down around them. Many Austrian Jews were shocked by the developments. My grandparents, like many other members of the Orthodox community, had settled in Vienna after the Russians pillaged their hometowns in Galicia during WWII. They were filled with gratitude towards Kaiser Franz Joseph, who had graciously allowed these penniless refugees to settle in his royal city, and had shown them consistent kindness. While there were some open exhibitions of anti-Semitism and clear signs of discrimination, it was no different from the way Jews had been treated for centuries. In many cases, the non-Jewish populace treated them with politeness and decency. Only three years earlier, when my great-grandfather, Harav Yitzchak Meir Heschel, the first Kopycznitzer Rebbe, zy”a, was niftar in 1935, the non-Jewish neighbors on the block closed their stores during the levayah as a sign of respect. My great-uncle, the saintly Rebbe of Husyatin, zy”a, had warned of terrible times coming. When he emigrated to Eretz Yisrael several years before the Anschluss occurred, he advised Jews to flee Europe, but few were willing or able to heed his call. Many doubted the Nazis would ever enter Austria, let alone other countries such as Poland. They also did not have a place to go to. Strict quotas severely limited immigration to the United States, and the British were issuing only a very limited number of entry certificates to Eretz Yisrael. 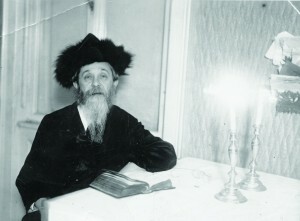 My grandfather, Harav Avraham Yehoshua Heschel, zy”a, had succeeded his father as Rebbe. And, even though Kopycznitzer Chassidim in America had expressed interest in his moving to New York, he was unwilling to leave his followers. The reign of terror, the relentless persecution, began immediately after the Anschluss. Formerly friendly neighbors and courteous business partners revealed themselves as ferocious anti-Semites. Nazis and their sympathizers were everywhere. The unthinkable had occurred. A city which had been a relatively safe shelter for Jews had turned into a lion’s den. Two decades after they had been forced to flee their cities and towns during the “Great War,” many of the Galician Jews who had settled in Vienna found themselves homeless again when the Nazis drove them out of their homes and into the streets. The 12-room apartment on Rupertgasse which served as the center of my grandfather’s court, a home famed for its constant acts of chessed, was confiscated. The family (my grandparents and nine of their children — the oldest daughter was married and living in Poland) was forced to relocate to a small apartment on the Taborstrasse. Again and again, including on Shabbos and Yom Tov, the Nazis came for my grandfather and forced him, along with other leading Rebbes and Rabbanim, to clean the streets with toothbrushes. As the Rebbes and Rabbanim crawled on the ground, Austrian women passing by stomped on their fingers with their high heels. 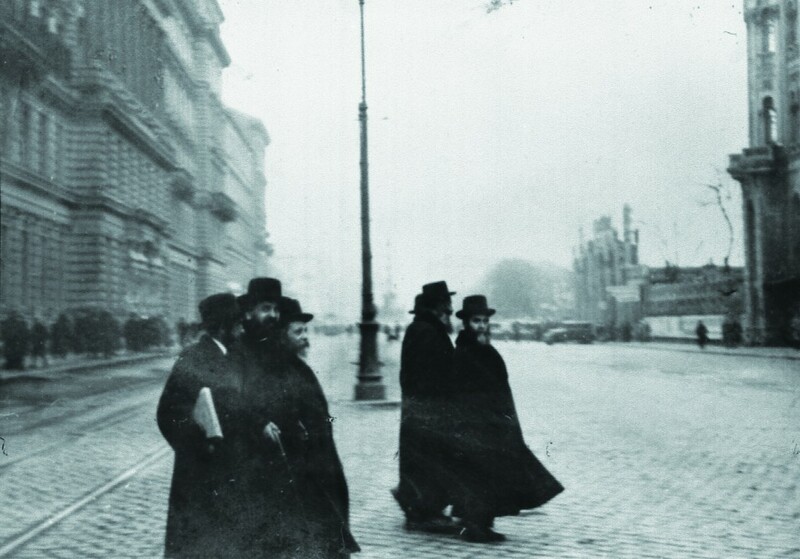 Harav Avraham Yeshoshua Heschel, the Kopycznitzer Rebbe, zy”a, (third from left) in Vienna. A photograph of my grandfather cleaning the street made its way to America and prompted urgent efforts by Chassidim to procure a visa. Eventually a visa was obtained for my grandparents and the three youngest children. My Tante Malka, a”h, (who later married Rabbi Aaron Lemberger, z”l), was worried about her shidduch prospects in the “treifene medinah” and decided against joining her parents. She was legally adopted by our great-uncle, the Sadigura Rebbe, and went with him to Eretz Yisrael. My grandfather was torn between his responsibility for the safety of his younger children and his concern about leaving his followers and the other family members. He was especially worried about abandoning his oldest son Yisrael, and his younger brother Moshe. He wrote to his uncle, the Rebbe of Husyatin, for advice. The Husyatiner Rebbe urged him to leave, explaining that in America, he would be in a far better position to try to rescue others. But leaving Austria was a very complicated affair. My aunt Manja, a”h, (who would later marry Reb Mottel Fink, z”l), volunteered to start making the rounds at the various government offices. Some six decades later, I interviewed her about those fateful days. One day she came home to find the family terribly distraught. “What happened? Where’s Father?” she asked in alarm. “They took them away,” she was told. The Nazis had come to the apartment and ransacked it. They took every single item from the china closet. Soon they found the steamer trunk in which the family had hidden its silver items and family heirlooms after they had been forced out of their previous apartment. “They made my father and my brother Srul carry it and took them to an unknown destination,” My aunt Manja told me. “The Nazis returned,” she continued, “and searched the house again, and stripped everybody of their valuables. Any piece of jewelry — a ring, a watch — was taken away. They took some linen that was prepared for my older sister Chava’s trousseau. “When I came back, we started running through the streets, looking for them. Everybody had something to say. ‘They’re cutting everybody’s beards,’ people informed us, ‘in the park.’ We went to the park. There were a lot of Nazis; we couldn’t go in. We didn’t know what was happening. “I think it was three days. My father didn’t come home; my brother didn’t come home. Daytime we were in the street, searching; at night we were looking out the window. Harav Avraham Yeshoshua Heschel, the Kopycznitzer Rebbe, zy”a, on his last Motzoei Shabbos in Vienna before fleeing the city. The Nazi was so astonished that he didn’t cut off the beard. I heard another firsthand report from someone who was with my grandfather during those days of captivity. He was 15 years old when he was grabbed off the street and taken by the Nazis to the police station. “‘I am afraid,’ I told him. “‘You don’t have to be afraid,’ the man told me. “And they let me out. They let me out! They kept my Uncle Yisroel for a few days. When he was finally released, after being brutally beaten, he was given 24 hours to leave Vienna. Loyal Chassidim procured some papers on the black market and he was able to leave for England. The English proceeded to deport him to an internment camp in Australia. My uncle, who was a very special and beloved person, lived to be over 80, but for the rest of his life he suffered from the injuries he had received at the hands of the Nazis. Many years later, in a conversation with the Klausenburger Rav, zy”a, my grandfather revealed that one night before he was to leave Vienna, he was faced with an enormous dilemma. He had the sum of money needed to buy tickets in the morning for the train to safety, but never in his life had he slept at night with money in the house; he had always distributed all the money to tzedakah before he went to sleep. On the other hand, he knew that it was a matter of pikuach nefesh to leave Vienna. “Hashem has been with me until now, and Hashem will surely be with me further,” he decided, and distributed every last groschen to tzedakah. My grandfather reestablished his court in the Lower East Side of Manhattan, and his home at 132 Henry Street became a legendary address for chessed, miracles and inspiration. While my grandparents and nine of their children eventually escaped the clutches of the Nazis, my oldest aunt, Leah Rochel, and her husband, Harav Efraim Fishel Horowitz, Hy”d, the Rav of Tisminitz, were killed by the Nazis. My great-uncle Reb Moshe Heschel, Hy”d, who spent his days giving chizuk to other Jews, was also killed al kiddush Hashem, and the Nazis mailed his wife a container they said contained his ashes. My paternal grandmother’s sister Devorah Miriam and her husband Aryeh Leib Dermer, Hy”d, who lived in Vienna before the war, were also killed by the Nazis. Numerous other family members residing in Poland were killed as well. May Hashem avenge their blood. Author’s note: In subsequent interviews with other survivors, I learned that the experiences of my family were typical of what happened to many other Jews in Vienna in those dark days following the Anschluss. This article appeared in print on page D10 of the March 13th, 2013 edition of Hamodia.